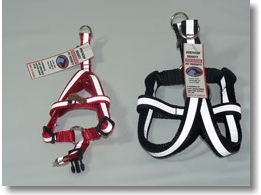 The following collars are all adjustable in length, and have quick-clip, side-release buckles and metal O-rings. 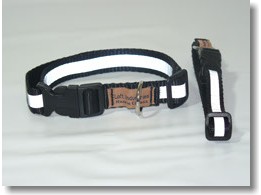 The leading design of these collars remove all the stress off the composite buckle. The buckle must pass through the O-ring in order to be effective. These collars are available in 1/2", 3/4" and 1" widths. 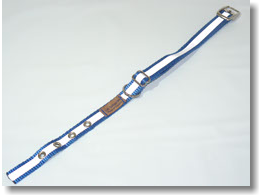 This collar is a combination Buckle-Style collar and an Adjustable Style collar. 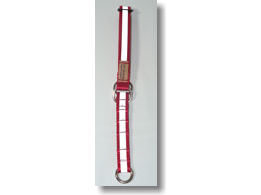 It is made with a cast metal buckle for strength, a metal Dee ring for leash attachment, and a metal slider to adjust the length of the collar. These collars are available in 1/2", 3/4" and 1" widths. These collars have eyelets or metal grommets re-enforcing the holes for the buckle. 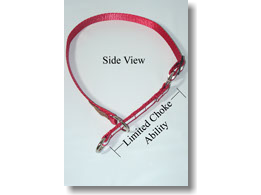 This is a limited slip-choke and humane training collar. Made from durable nylon webbing and nickel-plated welded steel rings. This collar has a quick-response design as well as being gentle on the dog's coat. Available in 1/2", 3/4" and 1" widths. 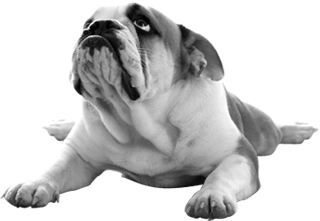 This is for the tough customers, for those dogs that need the extra persuasion. Made from tough nylon webbing and nickel-plated chain assemblies. These high-visibility leashes are four feet in length with a nickel-plated bolt snap at one end, and an ample hand loop at the other end. Available in 1/2", 3/4" & 1" widths. 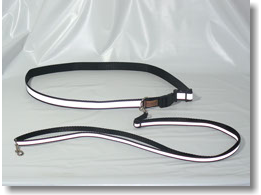 These high-visibility leashes are six feet in length with a nickel-plated bolt snap at one end, and an ample hand loop at the other end. Available in 1/2", 3/4" & 1" widths. These high-visibility leads are great for high-traffic areas, street corners, or any situation whre you need to gain quick control of your dog. Suitable for medium and large sized dogs. Available in 3/4" and 1" widths and 6 feet in length. 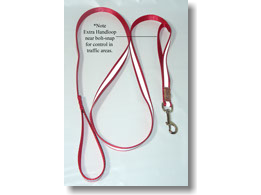 A perfect product for the person who wants to walk or run with their pet and do it hands free. 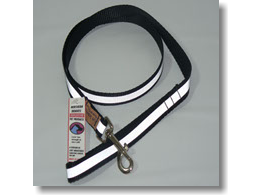 The Runner's Mate is made up of two pieces of high-visibility reflective webbing, one is an adjustable 1" belt that the person wears, and the other piece is an adjustable 3/4" or 1/2" leash that connects the dog to the person. The leash may be adjusted from 3 feet to 6 feet in length. This is a high visibility harness as well as the easiest harness to put on and take off. Simply open the harness up and lay it flat on the floor, then place one paw in each opening and pull the harness up the legs and snap the buckle together behind the front shoulders.Be sure to attach your bolt-snap to both Dee-rings.